Verne Q. Powell Flutes was founded in 1927 by Verne Powell to provide professional Flutists with custom-made, precious metal instruments. Powell Flutes continues this New England tradition of craftsmanship, along with a devotion to making the highest quality instruments. Powell offers an extensive choice of Flutes made in their Boston factory, including the Signature Series, Conservatory Handmade and Custom Handmade Flutes. Click on the models below to see the full range of Flutes available from Powell! Powell Signature Starting at $6,640 List Price: $7,720 The Verne Q. Powell Signature Flute features a sterling silver headjoint, body, and mechanism. This Boston-made Flute combines the quality and history of one of America's oldest Flute companies with modern technology. &nb..
Powell Handmade Conservatory ~ Silver Flutacious! Price ~ Starting at $8,860 The Verne Q. Powell Handmade Conservatory is an all-sterling silver instrument with a fabulous pinless mechanism. This Boston-made Flute combines the quality and history of one of America's oldest Flute co..
Powell Handmade Conservatory ~ Aurumite 9k Flutacious! Price ~ Starting at $11,590 The Verne Q. Powell Handmade Conservatory features a beautiful Aurumite 9k headjoint and body with a fabulous sterling silver pinless mechanism. 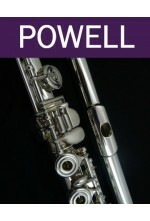 This Boston-made Flute combines the quality and history o..
Powell Handmade Custom ~ Silver Flutacious! Price ~ Starting at $14,260 The Verne Q. Powell Handmade Custom is an all-sterling silver instrument with a fabulous pinless mechanism. This Boston-made Flute combines the quality and history of one of America's oldest Flute companies with m..
Powell Handmade Custom ~ Aurumite 14k Flutacious! Price ~ Starting at $16,220 The Verne Q. Powell Handmade Custom is a stunning instument with a fabulous pinless mechanism. This Boston-made Flute combines the quality and history of one of America's oldest Flute companies with modern t..
Powell Handmade Custom ~ 14k Gold with Silver Mechanism Flutacious! Price ~ Starting at $25,790 The Verne Q. Powell Handmade Custom features a 14k gold headjoint and body wtih a fabulous sterling silver pinless mechanism. This Boston-made Flute combines the quality and history of one ..